The Newburyport Literary Festival takes place on April 25-27. This year the Festival honors local poet Rhina Espaillat. 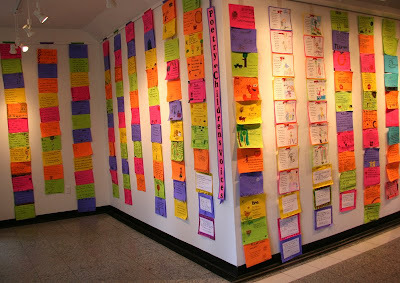 In connection with the theme of poetry, the Firehouse Gallery has an exhibition of poems by children. Kindergartners from the Brown selected and illustrated poems while students from the Bresnahan wrote and illustrated ones of their own. The poems are on a variety of subjects: nature, the seasons, friendship, sports, food, and family and in a variety of forms: acrostic poems, limericks, diamante poems, rhyming verses, and free verse. Written on colored paper and graced with lively illustrations, the display is a visual as well as verbal treat. I am the turquoise blue ocean of Bermuda. It feels good when people dive in me. I feel happy when the sun generously shines on me. I get angry when people pollute me. There once was a small lad from Cork. He especially loved the pork. He ate and he ate. He realized he was a dork. And it all came from my mom. Children's Voices will be on display through April 27 during normal Firehouse Gallery hours (Wednesday through Sunday 12-5 pm with extended viewing on performance mights until curtain time ) and throughout the Literary Festival.